This is our first entry level presentation scanner with EAS and UHF RFID capabilities. Its fast and reliable scanning is also easily configurable to your needs. 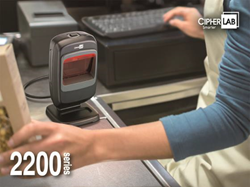 CipherLab, a leading innovator in Automated Identification and Data Capture (AIDC), would like to present the 2200 series presentation scanner, built specifically for the retailing, hospitality and transportation industries. The 2200 series’ omnidirectional scanning capabilities offers environments such as convenience stores, supermarkets, department stores and even airline check-in counters a hands-free operation which allows scanning to be continuous and efficient. Additionally, the 2200 series’ snappy high-speed scan rate assures the users with reliable 1D, PDF417 and 2D barcode scans straightaway. The users will instantly be able to read any barcodes quickly and efficiently. Moreover, it is capable of reading low contrast barcodes which eliminates the problem of scanning poorly printed barcodes, reflective surface label and LCD screens. Ultimately, your scanning needs will be free-flowing without any issues. “This is the first entry level presentation scanner with EAS and UHF RFID capabilities." Luis Wu, Vice President and General Manager of CipherLab USA said, "Its fast and reliable scanning is also easily configurable." For more details and specifications regarding CipherLab 2200 series or other CipherLab products, please send an email to NASales(at)cipherlab.com or contact the office at 888-300-9779. CipherLab is a global leader in the design, manufacture, and marketing of Automatic Identification and Data Capture/Collection products and systems. The company’s mobile computers and scanners are integrated into the networks of some of the world's best known logistics, retail, distribution, government installations and healthcare companies, helping them run more efficiently and effectively onsite and on the road. CipherLab USA is headquartered in Plano, TX. For more information, please visit http://www.cipherlab.com.